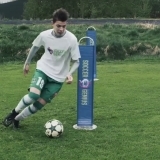 The Soccer Genius measurements protocol can be used by soccer players of all ages. Recommendations are in place for age group variances in testing protocol. It is our mission to provide comparative measurements from the world’s best players. Clubs can improve their players development and generate income revenue.